I was at a favorite restaurant of mine the other day picking up a pizza and telling them how disappointed I was that they don't have delivery when they informed me that they now have a delivery option. Huh? What's that mean? Well, it's called Grub Cab and whoever thought of this is brilliant! If you live in SW Florida you need to know about grubcab.com. It's only available from zip codes 33901 to 33993, as far as I can tell, but there are similar services in other areas. Apparently I've been out of touch because I didn't know about it and I suspect some of you didn't either so as usual I'm spreading the word. I'm sure each service is slightly different but basically they made arrangements with many of your favorite restaurants that don't offer delivery to be their delivery service. On their websites they post menus for each restaurant. You can place your order online (usually cheaper) or call and for a small delivery fee (around $4-$6) plus driver tip you get your food delivered. 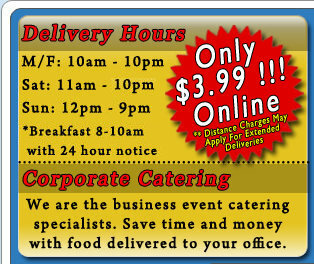 Here are a few others: deliveryandtogo.com in SE Florida, delivery-king.com, mealcab.com, tampabaydelivered.com in the Tampa Bay area and grubtaxi.com in east Orange and Seminole Counties. If anyone knows of other services please post them in the comments.